A great night of fights took place at Mohegan Sun Arena in Uncasville, CT last night (Saturday), as JOE DEGUARDIA’S STAR BOXING presented another exciting SLUGFEST AT THE SUN. The undercard had a distinct New England flavor as the crowd came out early and loud, cheering on their local New England talent. 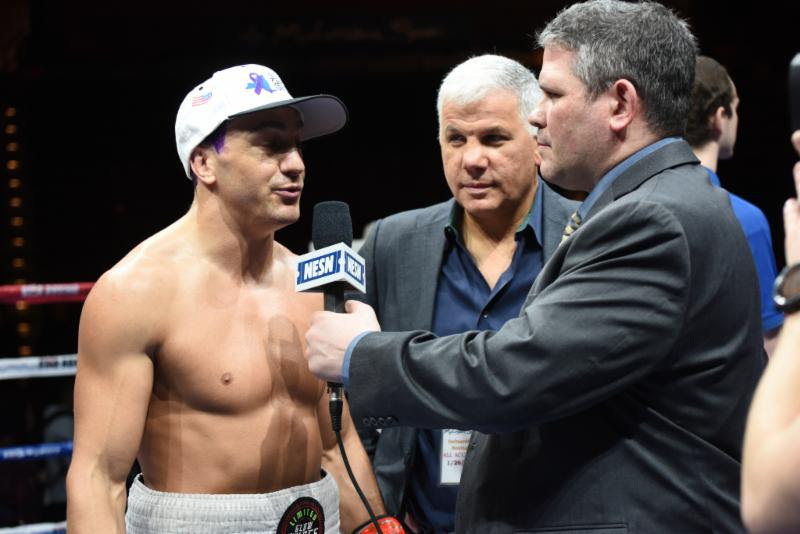 In the main event, New England fans were treated to feared knockout artist CLETUS “THE HEBREW HAMMER” SELDIN (now 23-1 19KO’s) as the Hammer-Head fans traveled from Seldin’s Long Island hometown to Mohegan Sun. Taking on Hungarian puncher, ADAM MATE (now 28-14 21 KO’s), Seldin, as usual, came streaming across the ring from the opening bell. Throwing precise haymakers, and clearly looking for the knockout, Seldin stalked Mate and just twenty seconds into the first round, landed a devastating right hand that sent Mate crumbling to the floor. To Mate’s credit, he rose off the canvas attempting to stabilize himself, defeating the referee’s ten count. However, Seldin pounced yet again, trapping Mate in the corner, dropping him once again for the final time with precise bombs. Joe DeGuardia promised boxing fans to not blink during this scheduled ten round main event and the Mike Tyson-like Seldin blitzkrieg lived up to the promise, with the Knockout coming at the official time of 0:48 seconds of the first round. 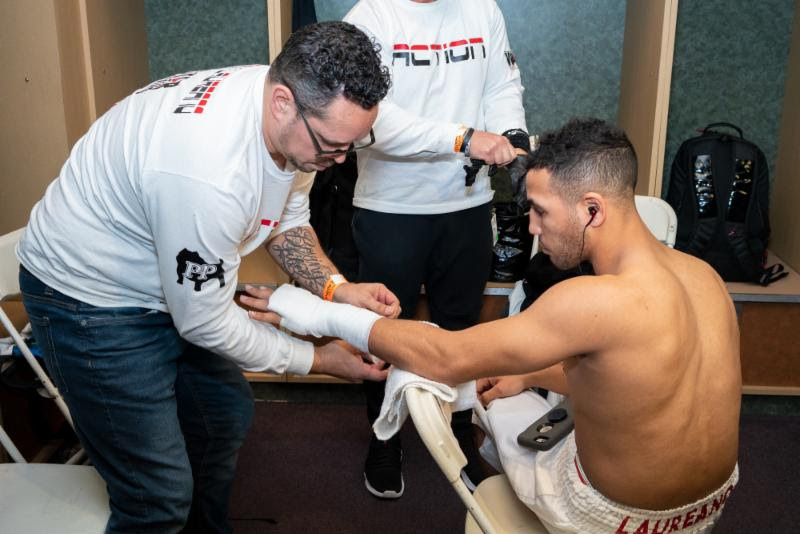 “ACTION” ANTHONY LAUREANO (now 10-0 3KO’s) and RONALD RIVAS (5-9-2 3KO’s) put on a show for every minute of their 8 round co-feature bout, entertaining the crowd who cheered with an ever-increasing excitement and intensity throughout the bout. Both fighters earned the respect of the fans for their effort, but it was Laureano who showed his superior skills, using an effective jab, left hook, damaging body punching, and unmatched determination, which led him to a unanimous decision victory by scores of, 80-71, 79-72 (x 2). The fighters engaged each other from the opening bell and by the second round Rivas was cut and bleeding. In the third, Laureano banged the game Rivas on the ropes and across the ring. Laureano’s ceaseless attack overwhelmed Rivas in the 5th round sending him to the canvas with a left hook to the body. The slugging continued for the remainder of the fight to the delight of the cheering crowd at Mohegan Sun, concluding with Laureano throwing punches in bunches from all angles. Be sure to tune in for the replay of this one as the hometown hero, Anthony Laureano put on a show for his local fans. In a battle for the Jr. NABF Super Featherweight title, ANGEL “EL GALLO” SUAREZ (now 8-3 3KO’s) challenged champion WILLIAM “THE SILENT ASSASIN” FOSTER (9-0 6KO’s). Foster got it started early, boxing swiftly, landing by using his quick hands. However, Suarez would not be denied, finding openings in the second round, as blood began to come from the nose of Foster. The two waged war against each other, for the entirety of the 8-round title fight in a fantastic tactical battle reminiscent of yesteryear. Having gone the distance, the judges scored the bout 79-73 (x3) in favor of William Foster, who retained his Jr. NABF Super Featherweight title in an exciting bout. JACOB “LEFTY” MARRERO (now 2-0 1KO) seemingly had all of Bridgeport behind him in his second professional bout, as he took on Hungarian ZSOLT KARVAJ (now 3-3 3KO’s) in a scheduled 4-rounder. Marrero wasted no time sending Karvaj to the canvas two times in the opening round. Finally, a straight right hand by Marrero scored purely on the chin of Karvaj, causing referee Danny Schiavone to halt the action with 1:07 expired in the first round. 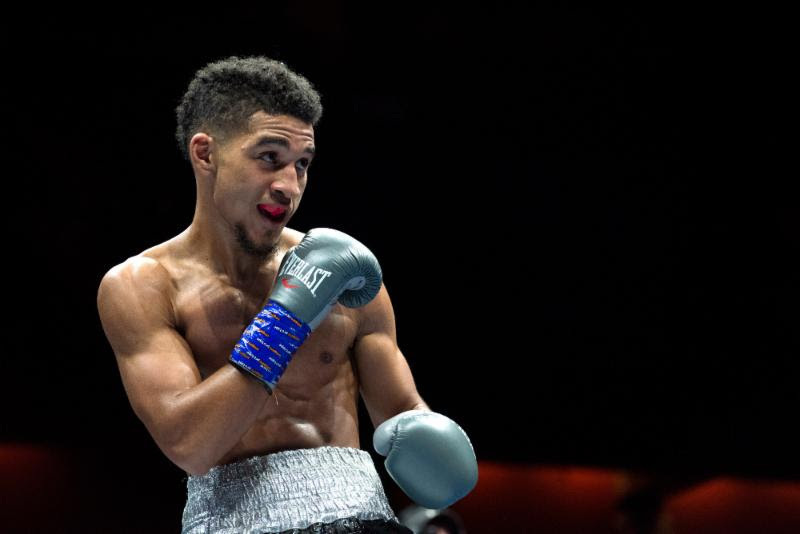 In a thriller, fan favorite NATHAN MARTINEZ (now 2-0) had his second professional bout against a tough Philadelphian, JERROD MINER (now 1-3-2 1KO). The opening round saw great back and forth action, as Miner scored with two hard rights, while Martinez found a home for his right hand as well. It was a very close first round but the second saw Martinez go on an impressive body attack, landing sharp, devastating shots to the midsection of the Miner. After 4-rounds of great action, the judges saw it, 40-36 (x2), and 39-37, in favor of Nathan Martinez, who improved to 2-0. In a 6-round welterweight bout between RONNIE “TEFLON RON” AUSTION (now 10-1 7KO’s) and Waco, Texas native, MARQUIS “THE HAWK” HAWTHORNE (now 6-9 1KO) both fighters began slow, in a feeling out first round. Austion looking to counter, while Hawthorne pressed, seemed to be the theme throughout the fight. Finally, in the fourth round, the action began to pick up, as Hawthorne was both throwing and landing in high volume. After losing a point for holding in the fifth round, Austion was unable to close the deficit, as Marquis Hawthorne, in a big upset, defeated the previously undefeated and heralded Austion by scores of 57-56, 58-55, 59-54. DAVID PAPOT (22-0 3KO’s) of Saint-Nazaire France was scheduled to make his USA debut agains the tough COURTNEY PENNINGTON (12-3-2 5KO’s) on Saturday night, however two days before fight night, Pennington had to pull out of the bout due to back spasms. Star Boxing then brought in RONALD MONTES (18-11 16KO’s) of Columbia, on short notice, to take on the tough Frenchmen. Unfortunately Montes failed his physical due to a high pulse rate and the bout was not sanctioned by the Mohegan Tribe Athletic Commission, causing it to be pulled from the card. The New England area will have the opportunity to catch the much anticipated “SLUGFEST at the SUN” via tape delay on NESN. Catch CLETUS “THE HEBREW and local fan favorites, East Hartford’s “ACTION” ANTHONY LAUREANO, New Haven’s WILLIAM FOSTER III and Bridgeport’s JACOB “LEFTY” MARRERO for a great night of fights. 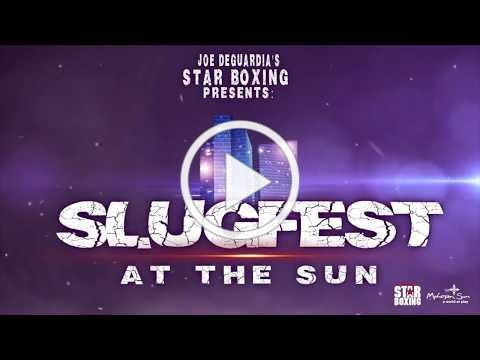 “SLUGFEST at the SUN” is presented by Joe DeGuardia’s Star Boxing. The event takes place Saturday, June 30th at Mohegan Sun, in Uncasville, CT.
Joe DeGuardia’s Star Boxing “SLUGFEST at the SUN” series is the a premier professional boxing experience in Connecticut. Live from the beautiful Mohegan Sun Arena, “SLUGFEST at the SUN” has seen some of the best and brightest in boxing. This includes, two-time world champion Demetrius “Boo Boo” Andrade, former WBC International Light Heavyweight Champion, Joe Smith Jr., and world title challenger Delvin Rodriguez, amongst many others. Connecticut Boxing Hall of Fame inductee, Joe DeGuardia, has consistently given the boxing fans of Connecticut, world class fights, right in their own backyard. “SLUGFEST at the SUN” also gives the north east’s rising boxing stars an avenue to world title contention. From world title fights, to world class boxing skill, Mohegan Sun has seen it all, delivered by Star Boxing. The “SLUGFEST at the SUN” series offers an affordable, fan friendly action packed, entertaining night out, that is guaranteed to have you on your feet from the opening bell. Mohegan Sun Arena is now ranked consistently among the top venues in the world according to Billboard Magazine, Pollstar and Venues Today. It has won “Casino of The Year” at the Country Music Awards in 2008 & 2010 and in 2013, was voted “Arena of The Year” at the G2E Global Gaming Conference in Las Vegas. Mohegan Sun Arena was also ranked among the top 10 arena venues in the nation for 2014, regardless of size. In 2015, Mohegan Sun took home the IEBA award for “Casino of the Year.” Mohegan Sun also won “Casino of the Year” in 2 categories at the 2013 & 2016 Academy of Country Music Awards. For more information on concerts and other great events, visit Mohegan Sun. For information on this week’s schedule, call the Entertainment and Special Events hotline at 1.888.226.7711, ext. 27163. The Tudor Advisory Group provides strategic consulting services, coaching, and education in the areas of organizational improvement (Lean/Six Sigma), organizational development, and customer experience/engagement across industries for businesses, not-for-profit companies, and healthcare agencies of all sizes. Our experts have over 25 years of experience in the area of organizational transformation, partnering with companies to reach their strategic goals and objectives. We believe in knowledge transfer where we ensure the organization is self-sufficient prior to the end of the engagement. For further information please contact Alan Cooper at (212) 653-0086. Core BTS, Inc., has accepted the responsibility: to listen, learn, and communicate to create, provide, and support innovative technology solutions for its valued customers, employees, and investors. Core has provided business technology solutions to a wide variety of industries, helping companies achieve their goals, streamline operations, reduce costs, and enhance their bottom lines. Core’s story is one of convergence – bringing together the right people and organizations to build a leading provider of business technology solutions. Core employs a team of IT consultants and engineers that work to Envision, Execute, and Empower our clients by offering design, implementation and on-going support services. For a quarter century, Star Boxing keeps on swinging! Star Boxing has consistently delivered boxing events of the highest caliber and attracts loyal fans from all corners of the globe. From the Antonio Tarver – Roy Jones trilogy to the meteoric rise of Chris Algieri and Joe Smith Jr. from the Rockin’ Fights Paramount Series, Star Boxing continues to work with and develop world rated contenders and red hot prospects into future world champions. Star Boxing is revered worldwide throughout the industry for its credibility, integrity, and exciting fights. DMITRY BIVOL LOOKS SHARP IN TITLE DEFENSE AGAINST POWER PUNCHING JOE SMITH JR.